Acqualina is considered one of the most luxurious developments in Sunny Isles and is on par with any other luxury residence in South Florida. The Mansions at Acqualina will be taking luxury to a whole new level with their new 79 oceanfront villas. 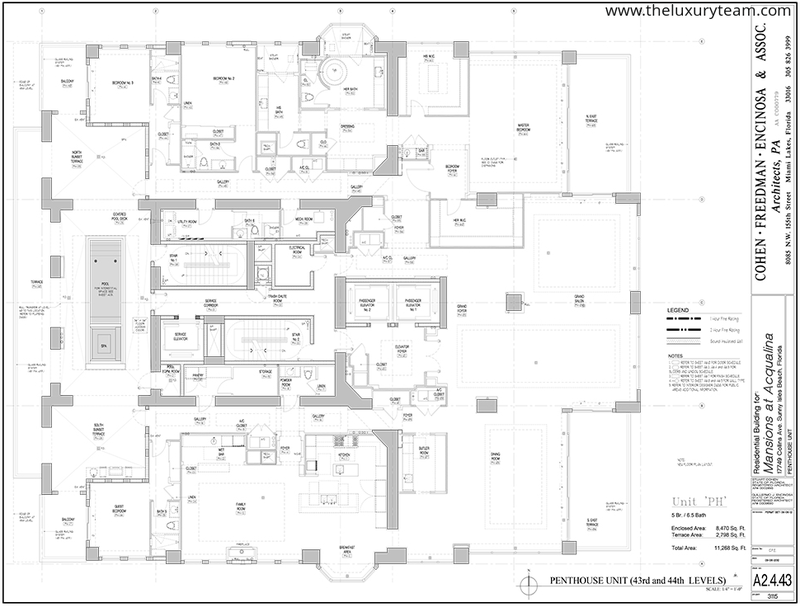 It will have a classic Mediterranean design and one of the most luxurious spas in all of South Florida. The luxury residences come in 3, 4 and 5 bedroom offerings and range in size from just over 4,500 square feet all the way up to 15,000 square feet. Prices for these luxurious residences begin at over $5 Million and go all the way up to over $50 Million.Similar to the original development, the Mansions at Acqualina will be a mixture of residences and hotel suites. Interiors are designed by Fendi Casa and will include high-end imported appliances, fixtures, cabinetry and flooring. 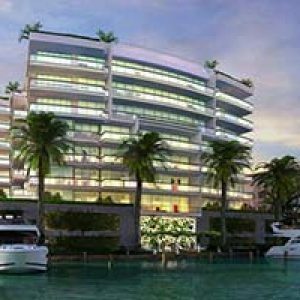 Every residence will include floor to ceiling glass with spectacular views of the Atlantic Ocean, the city and Intercostal Waterway. Amenities at Mansions at Acqualina will include a private cinema – this glamorous movie theatre and media center has plush seating, uniquely graded for optimal viewing. A Grand room exclusively for homeowners, this lavish room is designed for dinners, cocktail parties, and functions. Fitness center featuring state-of-the-art fitness equipment and design, residents can work out on their own for arrange for private training. A Children’s center complete with Computers, x-box & other electronic gaming. Plenty of sports equipment & activities makes life at the Mansions exciting and action-packed for children. The residence also includes a Hammam ultra luxurious spa for the ultimate indulgences. The Acqualina Spa by acclaimed ESPA provides a range of services from beauty treatments to full day experiences based on Ayurvedic principles. AcquaMarine children’s center provides a robust children’s program including outdoor, beach & aquatic activities, and various arts & crafts. Acqualina Beach Club features three pools, full services, and welcomes you to relax in style as you take in the stunning, oceanfront landscape. Other notable amenities include virtual golf, poolside private cabanas, fire pit, reflecting pool, and dog park. 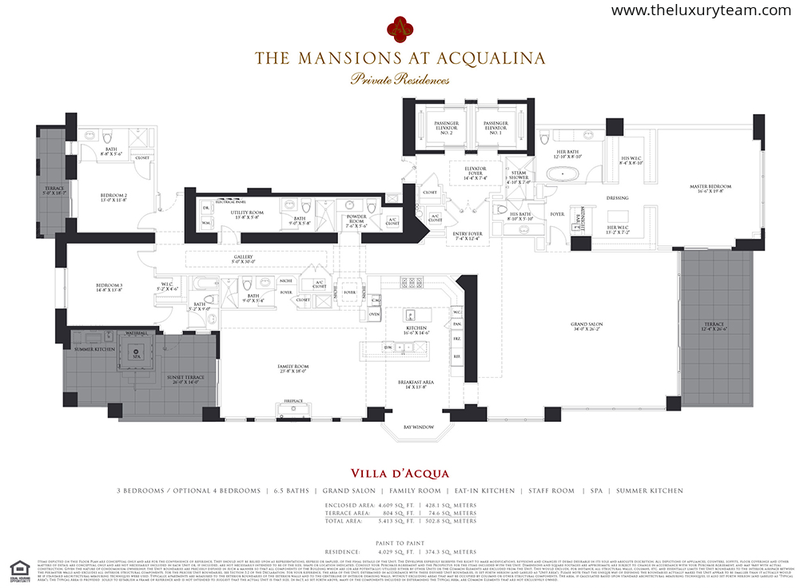 The Mansions at Acqualina are definitely one of the most anticipated developments in Sunny Isles. Sunny Isles is known for its extravagant lifestyle and the residents of Mansions at Acqualina will be immersed in luxury inside the Mansions in the world-famous Il Mulino New York restaurant, the award-winning Acqualina Spa by ESPA, Costa Grill, and the Acqualina Beach Club, as well as in the surrounding areas that include casual and gourmet dining spots and luxurious boutiques. Only 10 minutes away are the luxurious shops at Bal Harbour and just an extra 5 minutes will put you in the numerous shopping spots in Aventura. Miami and Fort Lauderdale International airports are less than 1/2 hour away and many executive airports are located nearby. Get your piece of ultra-luxury in beautiful Sunny Isles today.